This used to be fair­ly easy to answer, but with more brew­eries, and more beers, and what feels like a ten­den­cy away from the con­cept of the core range or flag­ship beer, it’s become tricky. There are beers we like but don’t get to drink reg­u­lar­ly enough to say we know, and oth­ers that we love but don’t see from one year to the next. We were think­ing of Oakham Cit­ra, of course – the beer that effec­tive­ly owns this unique Amer­i­can hop vari­ety in the UK, and has done since 2009. Cit­ra was very much the hot thing in UK brew­ing about six or sev­en years ago. It was a sort of won­der hop that seemed to com­bine the pow­ers of every C-hop that had come before. It was easy to appre­ci­ate – no hints or notes here, just an almost over-vivid horn blast of flavour –and, in our expe­ri­ence, easy to brew with, too. We’re bad at brew­ing; Amar­il­lo often defeat­ed us, and Nel­son Sauvin always did; but some­how, even we made decent beers with Cit­ra. Now, with the trend­set­ters hav­ing moved on, Cit­ra con­tin­ues to be a sort of anchor point for us. If there’s a beer on offer with Cit­ra in the name, even from a brew­ery we’ve nev­er heard of, or even from a brew­ery whose beers we don’t gen­er­al­ly like, we’ll always give it a try. Hop Back Cit­ra, for exam­ple, is a great beer. It lacks the oomph of Oakham’s flag­ship and bears a dis­tinct fam­i­ly resem­blance to many of the Sal­is­bury brewery’s oth­er beers (“They brew one beer with fif­teen dif­fer­ent names,” a crit­ic said to us in the pub a while ago) but Cit­ra lifts it out of the sepia. It adds a pure, high note; it elec­tri­fies. Since con­clud­ing that You Can’t Go Wrong With Cit­ra, we’ve been test­ing the the­sis. Of course we’ve had the odd dud – beers that taste like they got the sweep­ings from the Cit­ra fac­to­ry floor, or were wheeled past a sin­gle cone on the way to the ware­house – but gen­er­al­ly, it seems to be a sound rule. All con­sumers want is a clue, a short­cut, a bit of help. That’s what they get from IPA, or ‘craft’. And appar­ent­ly also from the name of this one unsub­tle, good-time hop vari­ety. Ten years ago, Marks & Spencer stocked a lim­it­ed range of unex­cit­ing beers, gener­i­cal­ly pack­aged, with no infor­ma­tion about where they had been brewed, or by whom. We would nev­er have imag­ined then that we would one day be able to order from them a mixed case of four pale ales each designed to show­case a sin­gle hop vari­ety. 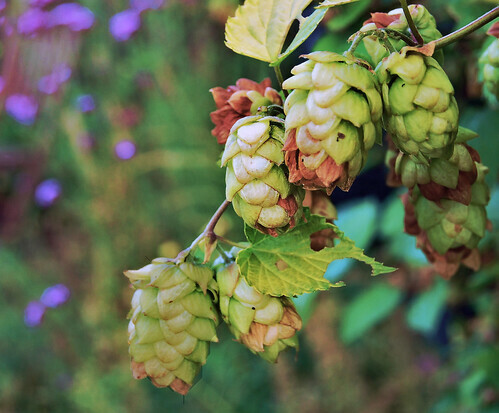 The brewer’s gold hop was orig­i­nal­ly devel­oped at Wye Col­lege in the UK in 1927 as one of the first ‘high­er alpha hops’ and is now most­ly grown in the renowned Haller­tau region of Bavaria where hop plant­i­ng dates back to 736AD. Most casu­al buy­ers won’t be ter­ri­bly inter­est­ed in that lev­el of detail – they don’t need to know about Wye – but they will pick up the intend­ed mes­sage: it’s sophis­ti­cat­ed stuff, this beer. The range isn’t quite a Brew­dog-style pseu­do-sci­en­tif­ic exer­cise in palate-train­ing: each beer in the M&S range is made by a dif­fer­ent brew­ery to a dif­fer­ent recipe, so the hop vari­ety is far from being the only vari­able in play. Nonethe­less, three of the four do a good job of putting the hop to the fore. Cas­tle Rock’s amber-coloured Cas­cade IPA remind­ed us, per­haps unsur­pris­ing­ly, of Sier­ra Neva­da Pale Ale: restrained by mod­ern stan­dards, but cit­rus-juicy and full-bod­ied. The Crouch Vale Brewer’s Gold has a mel­low cen­tral Euro­pean char­ac­ter, lemon-sher­bet hop­pi­ness being bal­anced by bready malt: it would be good by the litre. Oakham Cit­ra is one-dimen­sion­al, in a good way, being all about bright, Tech­ni­col­or trop­i­cal fruit flavours and aro­mas. After each, we felt some­what bet­ter edu­cat­ed. The dud is the Elgood’s Sov­er­eign. It doesn’t taste bad, as such, but like a beer with a dash of choco­late flavour­ing in it, pre­sum­ably from whichev­er dark malt gives it its red-brown hue. The cheap East­er egg char­ac­ter over­whelmed what is, any­way, a fair­ly del­i­cate­ly-flavoured hop entire­ly. Weird­ly, in the small print (as Simon point­ed out to us) ‘hon­ey flavour­ing’ is list­ed as an ingre­di­ent. Why is it there? And is it the source of a tacky vanil­la essence note? The beer cer­tain­ly didn’t taste of hon­ey. We bought our case of twen­ty 568ml bot­tles (five of each) from the M&S web­site where it was on dis­count from £40 to £36.50, plus £3.50 deliv­ery. UPDATE: we also bought a case of ‘dark beers’ for £40 and have post­ed some brief tast­ing notes on our Face­book page. Descrip­tion of Pen­zance Brew­ing Company’s Trink pale ale in the pro­gramme for a local beer fes­ti­val: “…fea­tur­ing the ever-so-now Cit­ra hop”. Lots of peo­ple don’t know what hops are or what they con­tribute to beer. Many oth­ers don’t under­stand that dif­fer­ent hop vari­eties, in dif­fer­ent pro­por­tions, added at dif­fer­ent times in the process, affect the flavour of the fin­ished beer. The very idea that there might be fash­ion­able hops would sur­prise many. In con­clu­sion, we think hyper-aware­ness of hops is one of the biggest dif­fer­ences between those who sim­ply enjoy beer and those who obsess over it, and it’s anoth­er thing to add to the list of per­spec­tive checks. Pic­ture by Dun­can from Flickr Cre­ative Com­mons. When we heard in 2008 that brew­ing had begun again in the small set up at the back of the William IV pub in Ley­ton, only a few min­utes from our house in Waltham­stow, we were very excit­ed. We were only more excit­ed to dis­cov­er that Brodie’s planned to brew a wide range of beers, from tra­di­tion­al milds through to fruit-flavoured beers, via impe­r­i­al stout. At that time, Lon­don brew­eries were few and far between, and this was right on our doorstep. Well, it seems safe to sug­gest that, now, three years on, they have reached the end of that learn­ing curve. We keep read­ing breath­less­ly admir­ing com­ments on their beers on Twit­ter from all kinds of dis­cern­ing peo­ple, and the pint of their Cit­ra (3.1%) we had at Cask in Pim­li­co last week was as good as any pale and hop­py beer we’ve had from any oth­er brew­ery. Crisp, well-defined, clean flavours; sparkling car­bon­a­tion; and all at bare­ly any alco­holic strength at all. A real knock­out. If you’ve been wary of Brodie’s hav­ing been a dis­ap­point­ed ear­ly adopter, it’s time to give them anoth­er go, and see what all the fuss is about.